Here are some desserts that I made in the past couple of weeks. None of them was made following a recipe, although I was inspired by what I saw on some blogs and cookbooks. Do you enjoy making cake rolls? I really do. First of all, I find them easier and faster to make than regular cakes. Secondly, there is a good deal of satisfaction that comes by completing the task without major cracks. Not that it really matters in the end product, as there are ways to hide the cracks unless they are really big. Something that is more difficult to hide is when the roll refuses to look like a roll and settles into an oblong or a semi-circle. Because of the practicality and the intrigue factor involved, I find myself turning to rolls whenever I fancy making a cake but do not feel like following a recipe from a cookbook. The cake you see below was made at the end of December, last year. The decoration idea came from a Martha Stewart yule log. 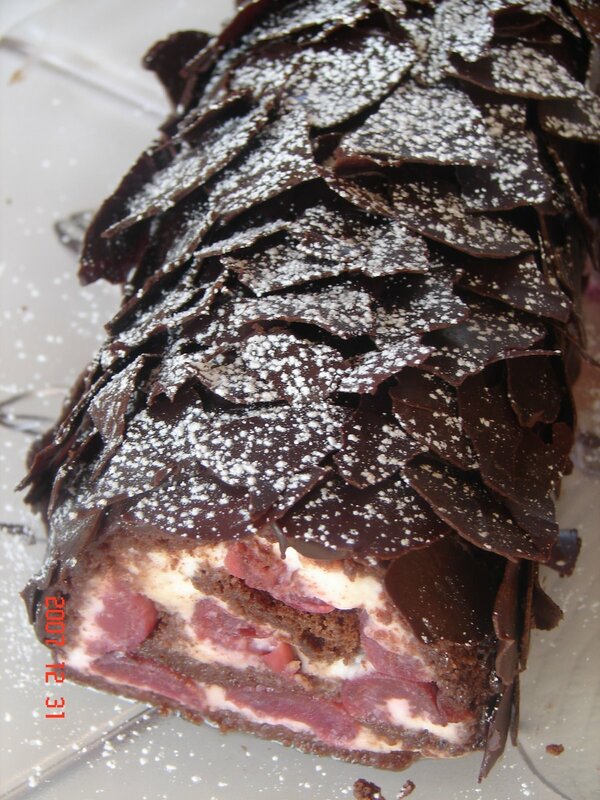 I thought it would be nice to make a Black Forest log, so I used chocolate genoise, cherry flavored syrup, mascarpone cream and cherries. Of course, this is a winning combination as far as taste is concerned. But, in my case, I was not successful with the genoise. On top of it, I used too much syrup to sprinkle on the cake causing it both to crack and lose its shape. The other difficulty was that the chocolate bark easily melted with the warmth of my hand, so I had to take several breaks to chill the chocolate until I finished the task. 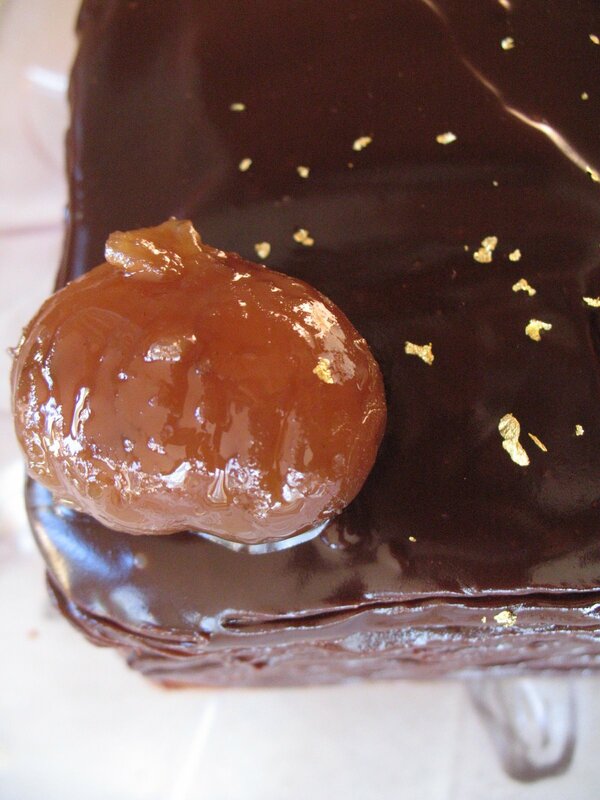 I learnt how to temper chocolate since then, and I think that tempering is the way to go with this kind of project. It certainly makes chocolate much easier to handle. In spite of the difficulties and misfortunes encountered, the end result looked and tasted good. This second roll looks a little better. I had some chestnut paste and defrosted white chocolate-cream cheese buttercream sitting in my refrigerator for some time. Neither amounted --quantitywise-- to anything by itself, so I decided to combine them. This made enough filling for a cake roll. 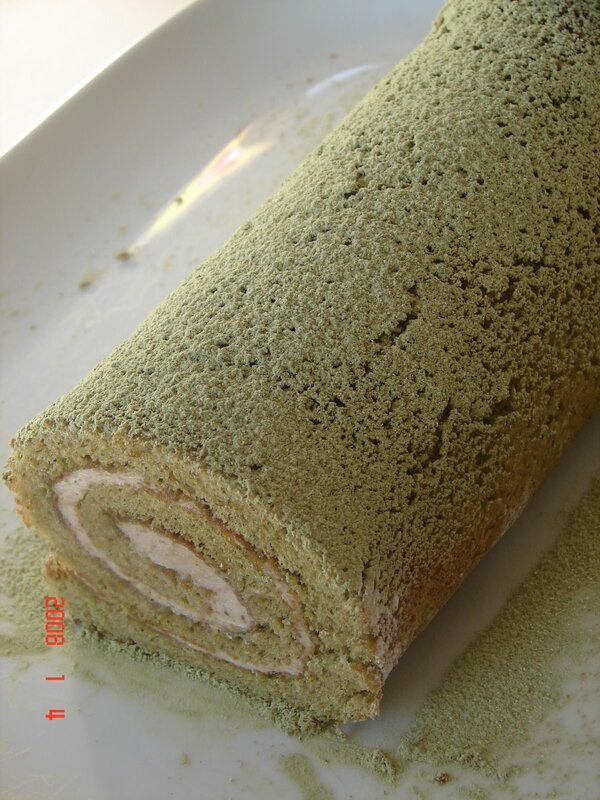 Since I like matcha-chestnut pairings, I made a matcha flavored hot milk sponge cake for the occasion. There was no leftover filling to frost the cake, so we simply dusted the top with matcha lightened with confectioners' sugar. Tiny cracks were still visible, but it was light and tasty. Here is something else that I put together for my daughter's in-class birthday party. When she visited France last year, she brought us violet syrup from Alsace. 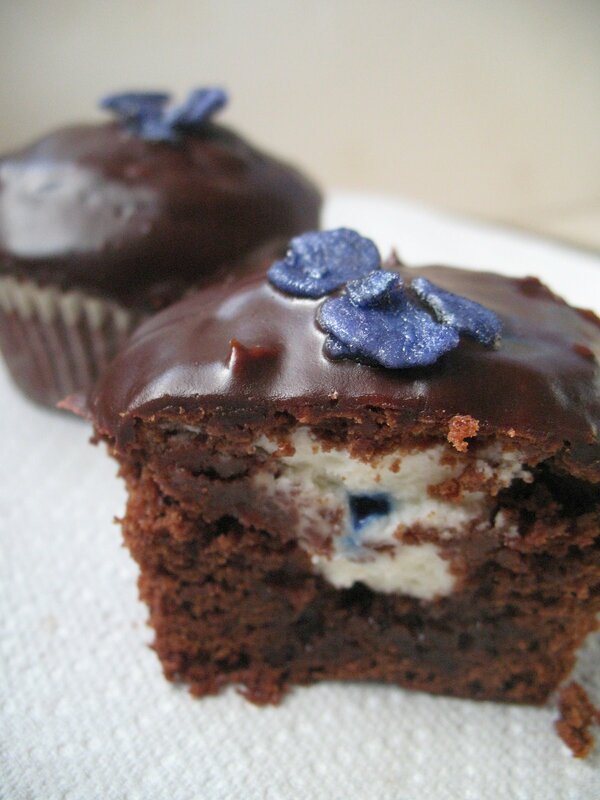 She fondly remembers those days, so I thought that it would be nice to make her violet cupcakes. I was initially thinking white chocolate as a nice decor for the candied violets, but they were already quite sweet. So I paired them with dark chocolate instead. I used violet syrup to wet the cakes, but the aroma was difficult to detect in the cupcakes. Although I could not achieve what I was after, I liked the way the cupcakes looked. They were delicious, too; if not in a violet-y way. After finally making Plaisir Sucre, I started fantacizing about working my way through the P Herme books I own, to try everything. I wanted to make his Faubourg Pave next. But reality dictated otherwise: I had chestnut puree in my refrigerator that needed to be put to use immediately. 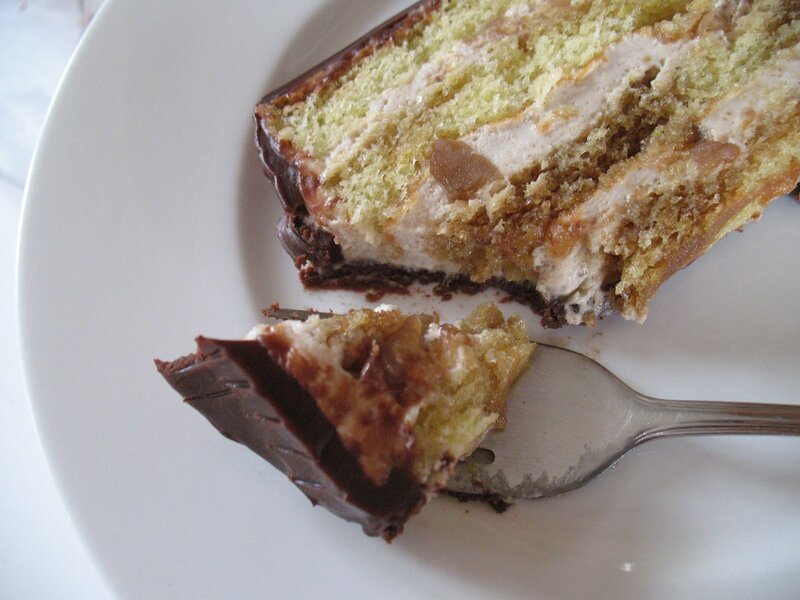 So instead of the Pave, I made a layered cake with hot milk-sponge cake, coffee syrup and chestnut cream. My mind was still with the Pave as I made it, so my creation inevitably looked like it. In the end, I was pleased with both the look and the taste. My finicky daughter even asked me which cookbook it was from.